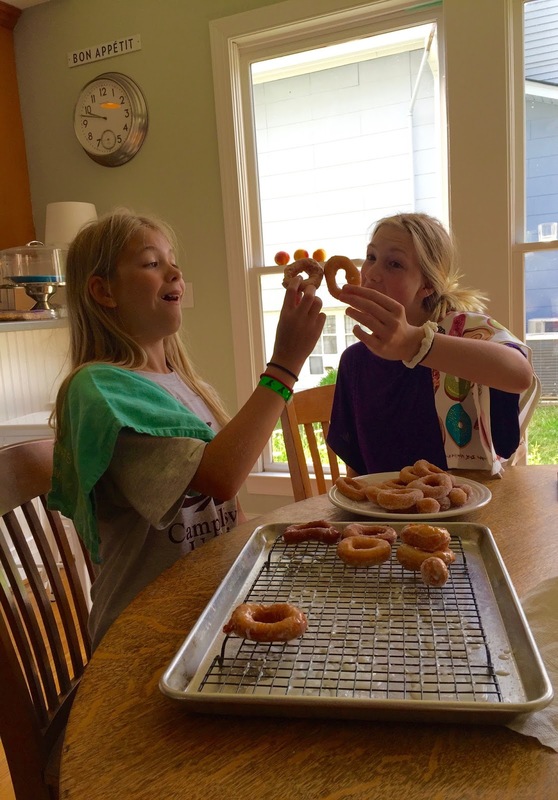 When I was a kid, we made these easy donuts every time we had a sleep-over! 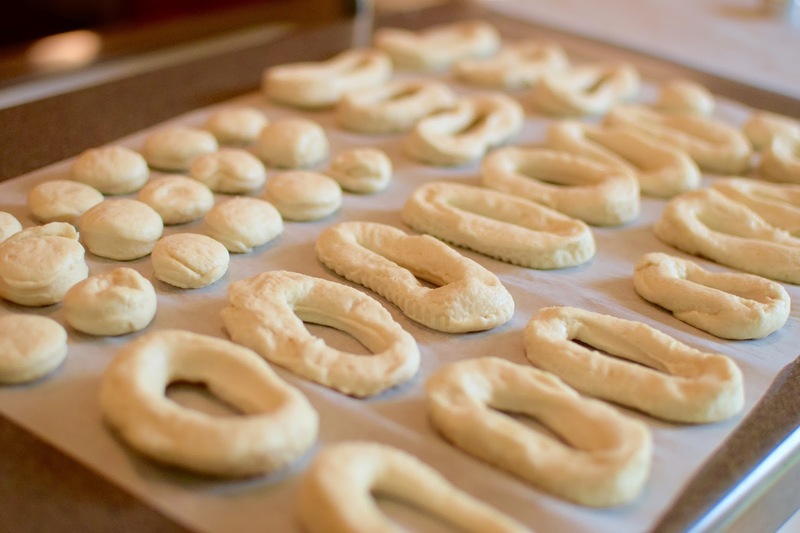 They are made from refrigerated biscuit dough. My mom always cooked them in Crisco- right in the big metal Crisco can. We always coated them in powdered sugar or cinnamon sugar. I have made them from time to time, but lately they have been the go-to when we have a sleep-over. 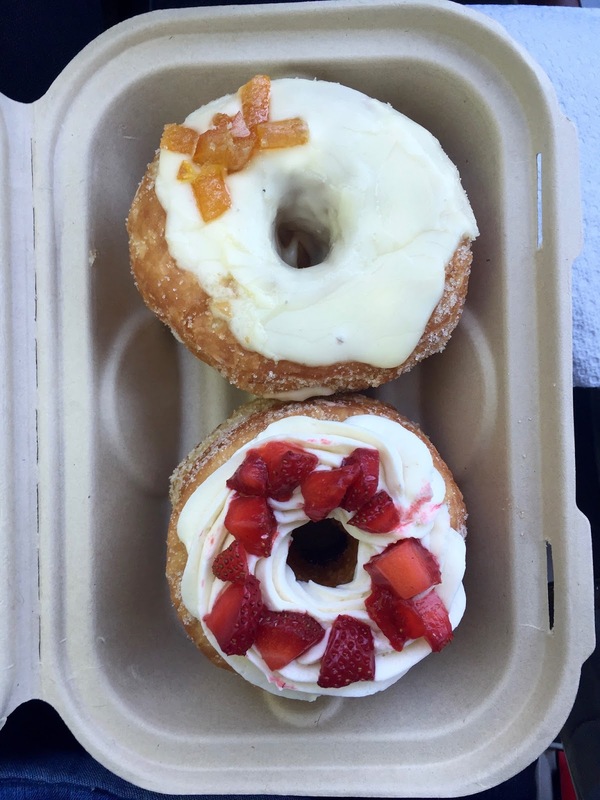 We have been experimenting with different oil, temperature and toppings/glaze. I have tried making the dough from scratch and have had more fails than successes. 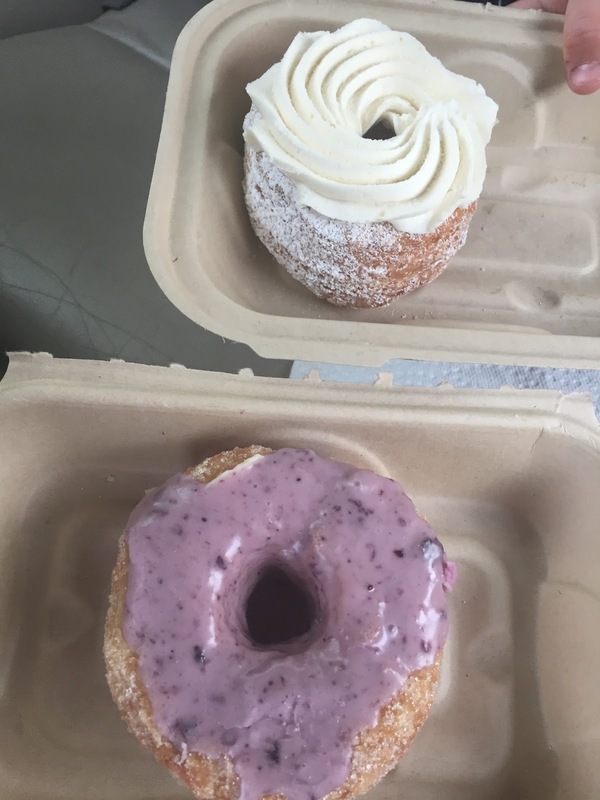 I was hoping to *perfect* simple donut-making before I posted them, but I decided to let go of perfection and post these. The best part is that they are inexpensive, super easy and so fun to get the family (or friends) involved. 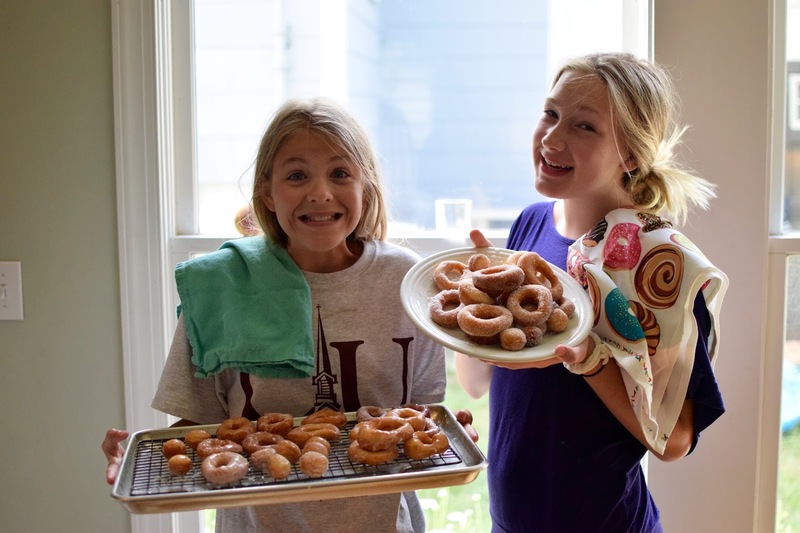 In a few minutes you can make dozens of donuts (and you never have to change out of your pajamas)! Using a small circle cutter, cut out the middle of the biscuit (or a good cap to a bottle that has a nice clean edge). 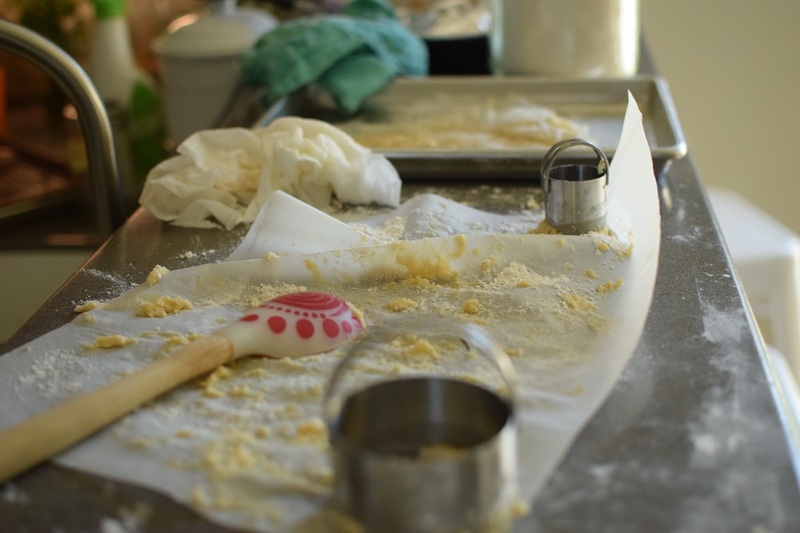 Depending on the diameter of your biscuit and the size of your circle cutter, you might need to pat out the biscuit dough a little bit with your hand. Set these aside, near the stove top. In a deep (but not large) bowl, combine 2 cups or so of powdered sugar in a bowl with drops of water, drizzles at a time, stirring between until the glaze is the consistency desired- liquid but not too thin. With a platter lined with several paper towels and a large slotted spoon or tongs in hand, begin gently sliding the dough into the hot oil. (You can put as many at a time in the oil as will fit, as long as they don’t touch the sides of the pan or each other.) Let them cook a minute or two, but watch closely! Once you can tell that the underneath is becoming brown, it’s time to flip. The second side is usually faster. 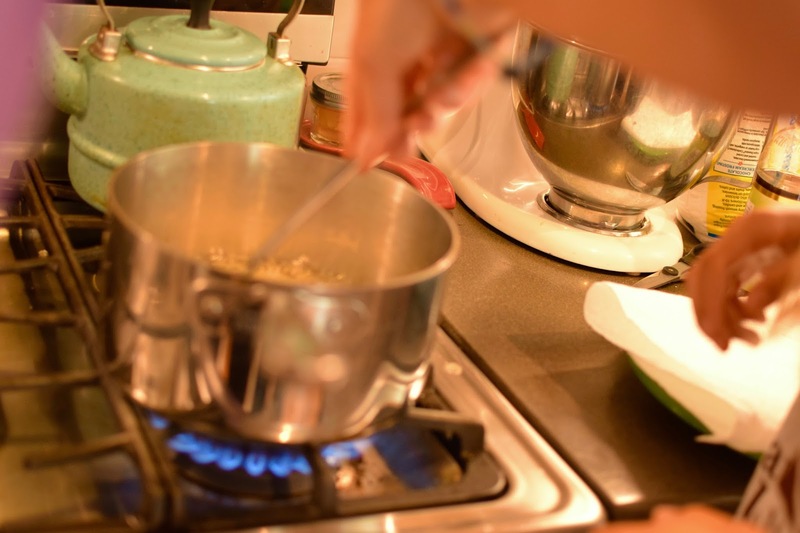 Once you have cooked on both sides and they have browned, carefully lift them out of the oil and tap to leave behind excess oil. Then promptly place on the towel-lined plate. Continue to cook more dough, carefully watching, turning and draining. 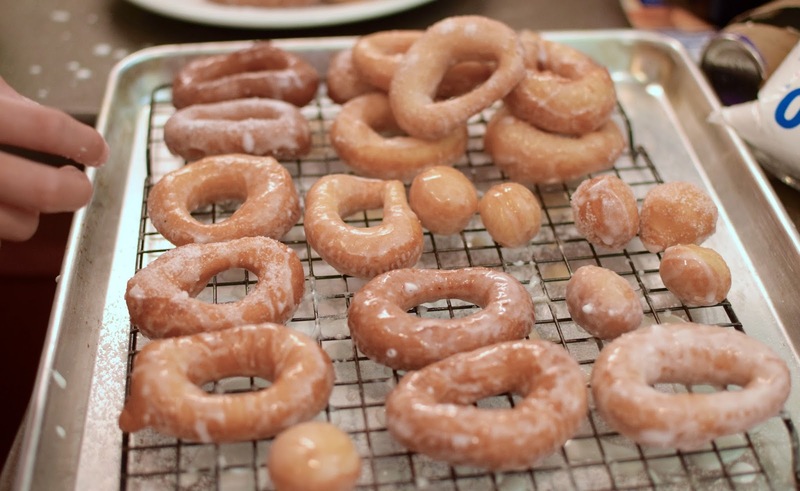 Have another person be the “glazer”, where they dredge the donut through the glaze and flip to coat. After tapping off excess glaze, place on a drying rack on top of a baking sheet (lined with parchment paper for easy clean up). 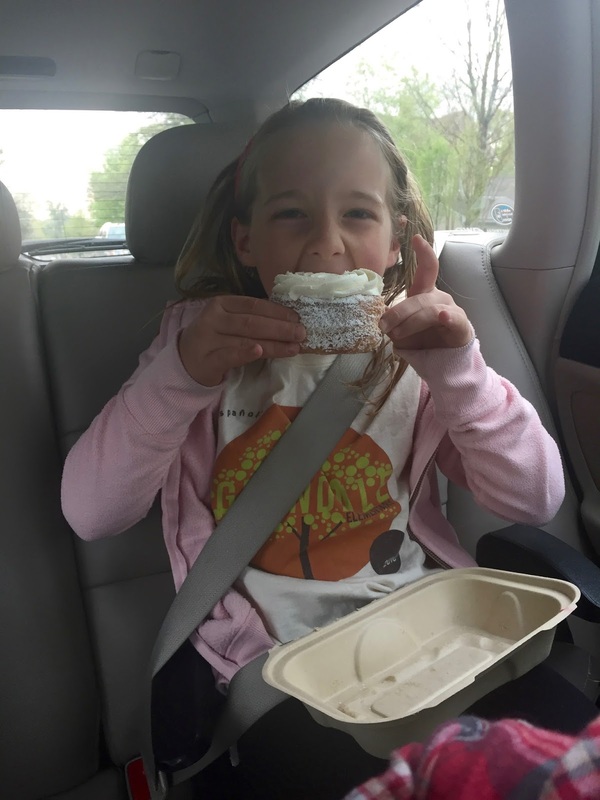 OR you can shake in a paper sack filled with powdered sugar for Powdered Sugar donuts, or granulated sugar or cinnamon & sugar. Get creative and try different things! We have tried sprinkling glazed donuts with sprinkles. We even used a syringe and piped them with raspberry jam. You really can’t go wrong. I just recommend you eat them immediately. They really don’t taste great the next day, sadly. These are not fancy (by any means) but they are fun and cheap and tasty. 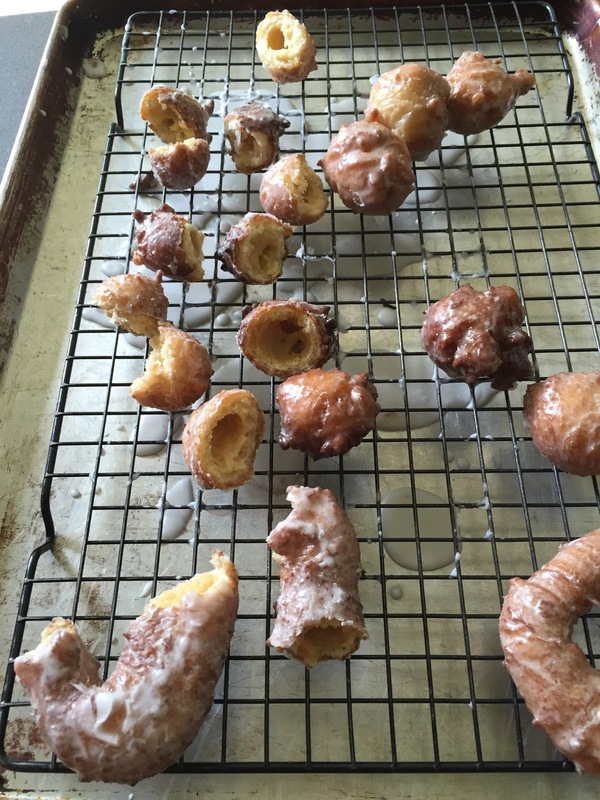 And these are photos from my FAILED and messy attempt at Old Fashioned from-scratch donuts. I am open to any tips you have to offer. 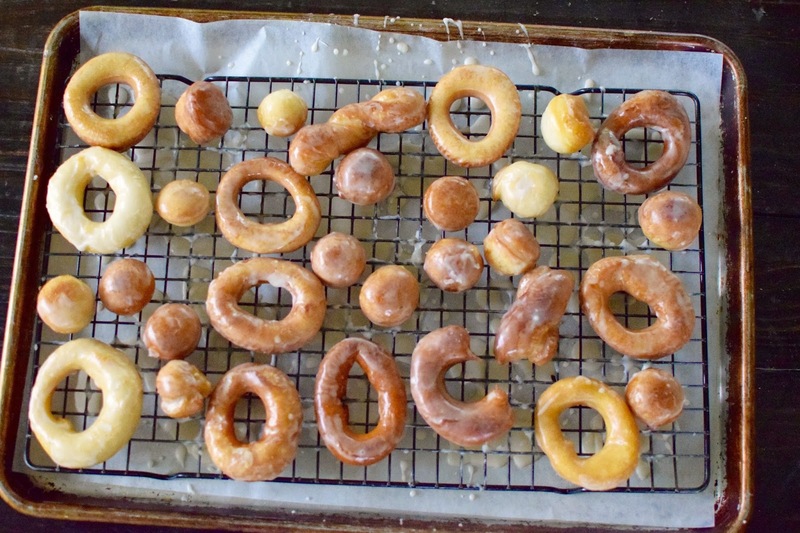 I want to find a way to make quick, yet tasty, dense from-scratch donuts but after several fails I have returned to using biscuit dough and letting the experts do the rest! 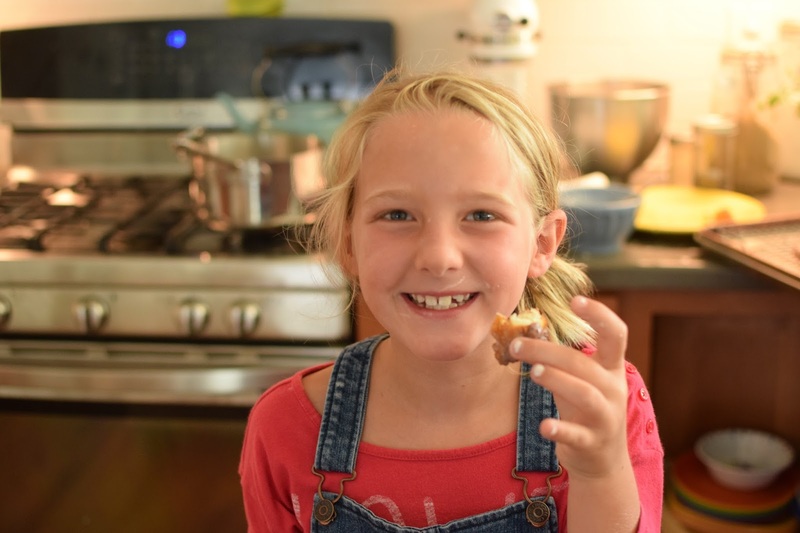 So next time you have a slumber party, or a vacation, or have a craving for donuts, buy some refrigerated biscuit dough and whip up some donuts… and life-long memories while you’re at it. This brings back so many fun memories. This has truly passed the test of time. FYI, back in the day, the Crisco can was actually metal, and so we could fry the donuts directly in the can. Now the can is some kind of cardboard, so there is a warning not to cook in the can. So how about chocolate frosted? Maybe AFTER glazing! Let me know when they are ready!